Well, I have a huge box of photos and slides in my storage locker, and I'm sure I could find a shot of The Beast in there somewhere. But I just couldn't get to it in time. 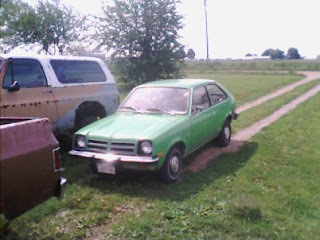 So I scoured the 'net for a picture of a lime-green 1976 Chevette like the one I drove, and actually found two. One is someone's actual car, the other is from a 1978 sales brochure. Here they are. The top photo is actually much closer to the color of my car than the sales brochure. There are lots and lots of very good reasons that these cars are not being produced any more. They were underpowered, overweight for their engine size, and it is the last car that anyone in our family ever owned that didn't have air conditioning. No matter how far down the scale we have gone, we will see how our experience can benefit others. That feeling of uselessness and self-pity will disappear. We will lose interest in selfish things and gain interest in our fellows. Self-seeking will slip away. Our whole attitude and outlook upon life will change. Fear of people and of economic insecurity will leave us. We will intuitively know how to handle situations which used to baffle us. We will suddenly realize that God is doing for us what we could not do for ourselves. I still remember the woman who chaired the committee looking across the table and saying, "Steven, because of actions in your past, you do not meet our requirements for financial stability and fidelity. And because of that, you have no 'gifts for ministry,' as far as this committee is concerned." And with that, they thanked me for coming, and my interview (and my 7-year meandering path toward ordination) was over. Now, I had in my head every syrupy-sweet phrase that people of faith say at times like this. I knew what to say - I'd been trained for this, after all. "This too shall pass, Steve...Just trust in Jesus, Steve, and He'll bring you through...God never shuts a door but that He opens a window, you'll see..."
But at that moment, I didn't care. I wasn't having any of it. All I knew at the time was that I had pursued a quest, one that a whole bunch of people had supported with their dreams, their wallets, and their prayers - and it was over. In my eyes, I'd failed - and in doing so, I'd let down my friends, my church family, God, and myself. For about 10 minutes, standing outside the church offices, and then sitting in my car in the parking lot, I really wanted a drink. I hadn't had a desire to drink in years - but that moment, I really wanted one. A bunch, in fact. I can't tell you exactly what happened... but I know that the voices of the saints in my life started talking to me. From 750 miles away, old Jon P., and my first sponsor, Bob S., chimed in, and said, "There is nothing bad in your life that a drink is going to make better." The voice of my first ministry professor, Tex Sample, reminded me, "No matter how tragic the circumstance, the Word of God is hope for those who struggle - and trust me, you will struggle." I thought of the congregation of Atonement Lutheran, waiting to hear me preach at the 5:00 service that evening. I thought of a lot of people - brothers and sisters in sobriety, brothers and sisters in Christ - and somehow, despite all evidence to the contrary, a modicum of sanity returned. That didn't mean that anger, resentment, and bitter disappointment didn't follow. The hardest task of that day was going to my mentors, friends and adoptive parents, Tom and Delphine Housholder, and telling them that no matter how much I wanted that dream, it wasn't going to happen. There was a lot of anger, shock, and tears that afternoon. It's been a long three years since that day - some of the darkest times I've had in sobriety. There were many months when I was absolutely unable to endure the thought of walking into another church again; weeks and months when it seemed that God had, if not forsaken me, then at least turned a deaf ear to my cries. There were a whole bunch of nights when I found myself hammering at heaven's door, and a whole lot of mornings when the thought of getting out of bed was almost unendurable. And yet, on this sunny day in April, there seems to be some considerable light at the end of the tunnel. After all, if I'd not been in Chicago, I would have never encountered Micah and Laura Jackson, the first bloggers I ever met in person. And I never would have thought to use the community of the blogosphere to pour out my struggles, laughter and tears on this journey. Of course, my eternal self-deprecation would still question the worth of all these bits and bytes that I've bled-out all over the 'net. But today, I know those thoughts are the voice of the Liar. In fact, knowing that is one of the gifts I've received straight from God (if you'll pardon the pun...). The other thing that I need to give thanks for is this. Over the last three years, my sister Sue's health has deteriorated considerably. And in June of last year, she hurt herself at work. In November, she was eventually declared disabled for the work she had done for almost 20 years. A month later, her husband was laid off from his job for four months. Now if I'd gotten my way three years ago, I would have been on internship right now, most likely in some tiny church in the rural Midwest (probably not far from Longforgotten, Nebraska, come to think of it). I would have been living hand-to-mouth, flat broke, and completely unable to move here to Ohio last October to help my sister and brother-in-law when they needed it. As much as I struggle with the work I do right now, and I struggle with so much of The Evil Empire, I am grateful beyond measure that when the time came to make a decision, I could do "the next right thing." God's plan is God's plan, not mine - for which I'm thankful. When my voice has gone silent, when I'm hopelessly contemplating my navel, you folks have been the ones to say, "Helloooooo.... anybody home?" I am grateful to the digital community of faith for these especially, but to everyone who has dropped in and left a comment, an encouragement, or a link to something truly funny/tasteless. I could not look back over the last three years without giving thanks to God for the sisters and brothers who have lifted me up, taken my emails and phone calls (even late at night on the road!) - Eric, Natalie, Neil and Mary Lou, Sandy, Ed, Cherri, Pastor Joe and John, Barry H., Mike M. and a host of others in Kansas; Nathan and Laura in Ankeny and Momma Delphine in West Des Moines, Iowa; John Z. in Florida, and Ted in Ohio. You have been the wind beneath my wings and in my sails, and many of you have helped me literally stay off the streets, at times. God has blessed me with your friendship beyond my ability to describe. Lastly, to my sisters, Sue and Sandy: I almost lost you, 10 years ago. I thank God that you and your husbands are in my life today. Thank God for National Public Radio, and the Michigan Public Radio's habit of airing the BBC broadcasts overnight. If they hadn't been broadcasting it, I might not ever have heard Hugh Sykes broadcast of Eyewitness Iraq, an amazing, painful and compelling story of what it is like to be in Iraq on the ground with the Iraqi people over the last two years. Take some time and listen to it. And again, thank God that there are still slivers of unsanitized news being broadcast that aren't dominated by our own home-grown theocracy. One of the differences I've noticed between the Vietnam war and the conflict in Iraq is that this time around, we in the US don't see the bodies. We rarely see the dead, wounded, and maimed; we almost never hear the daily butcher's bill on the news; it's rare to see the flag-draped caskets coming home. I could be wrong, but it seems that most of the dead and wounded US casualties are from Arkansas, Nebraska, and other low-volatility areas of the country, where people are loathe to stomp their feet and say, "I'm mad as HELL and I'm not going to take it any more!" According to one of several sites, the 9/11 casualties as of September, 2002 were 2,819 souls. As of 4/16, the US deaths from the war in Iraq is now 3,308. Add another 266 coalition deaths, and we're at 3,574. Not to mention more than twenty-four thousand wounded US soldiers. And we won't even talk about the bodies being dumped on the streets of Iraq by insurgents, day by day. The potential body counts of those casualties are truly horrifying. And the leaders who led us to Iraq on false pretenses now say we need to stay there to "win." But I - and many of my fellow citizens - are tired of shedding blood to protect the national-sized ego of a few megalomaniacs. When the sons and daughters of the people calling the shots are on the front lines, we'll see how the battle goes. But so long as it's young men and women of promise from rural America, there is no incentive to protect the sons and daughters of the "silent majority." And then, just when we thought it could not get more horrible, the ground ran red with student's blood in Blacksburg, Virginia. One (so-far) unidentified gunman, and 32 victims. Dozens of others wounded. My heart, numb as it is, goes out to the families of the dead and the wounded. Whether overseas or in our own schools, we need to do what we can to stop the killing. It has been an incredibly busy, and exciting, and frustrating time. I apologize for being away for so long. Let me tell you why...and catch you up on what's been happening. I had a marvelous experience at a weekend recovery conference in Troy, MI March 23-25. It was a long work-week ahead of time to get to the place where I could take the time off, and so I raced out the door and just took off. But it was a marvelous weekend, and a great gift to myself. My 50th birthday was the 29th. It was, to be honest, just another day. Both sisters were working and unavailable for any kind of celebration. So I took a store-bought cake to the evening AA meeting, and then went out to dinner with a sponsee at Applebees. No big deal - just another day. About half-way through dinner that night, I started to feel really weird. And by the time 2 AM came around, I could tell that I was in the middle of a full-blown cold. I mean, full-blown cold. In the time from 10 PM to 2 AM, I left normality and became three of the Seven Dwarves simultaneously: Sneezy, Sleepy, and Grumpy. Ick. I somehow made it through two-thirds of the work day on Friday, and then said, "I just cain't take it no mo'," signed off and went to bed. And stayed there the whole weekend. The birthday dinner was put off (my sister and brother-in-law were still suffering with this crap too - they caught it first), so it made no sense to go to dinner feeling miserable. It hung on for another 4 days - and I just had very little energy to do much of anything. I missed Maundy Service, Good Friday service, and just barely had the energy to make it for the last Easter Service at a local Lutheran church. So I'm glad to be finally getting over all of that. Would I mind? Are you kidding? I was delighted! After all, Sue married into her husband's church - a fairly insular Missouri-Synod Lutheran church - and they just have never felt a part of, there. Sue has never really gotten over the whole "so, what?" attitude that she and Sandy had over church in our Catholic days - and her in-law's LCMS church was just not set up to handle "seekers" properly. So to have her express a desire to attend church was a big, big deal. So then the question was, "Where to go to Easter services where they won't be scared off?" In other words, where to go where (a) the word will be preached in a way that was not off-putting, (b) where brother-in-law Jeff would feel at least some connections or familiarity with the service, and (c) where the actual features of the service (liturgy, music, etc) would be high-quality enough to not drive them away? We ended up at St. Paul's Lutheran in Maumee, and it was everything I prayed for. The service was fairly traditional in shape and music - but all the service was shown on video screens ("hands free hymnals"! ), which my sister appreciated. And the sermon was very basic, but powerful. It was a positive experience for them - which was a great thing for me, too. I actually was motivated to reach out to the pastor (who, of course, was on vacation the week after Easter...) to talk with him. I don't know if that's where I'm called to be - but it could be a start. Then we went out and had an absolutely marvelous Easter/birthday dinner at Biaggi's (one of my favorite chain restaurants in the world) with both sisters and their husbands. Surprisingly uncrowded, and a delightful time. Sandy has started a new job, and is working the same kinds of crazy hours I was, so it was good for some "time away" for both of us. The work situation this last two weeks has been crazier than usual - it has been crisis after crisis after crisis, which is never fun. We ended up working until midnight on Good Friday (which really irked me) on a special project that absolutely, positively, had to be done that day, and then even more this last week. So when I had to leave early to go to Van Wert on Thursday, and to an awards banquet for one of the guys on Friday, I didn't even bother docking my time. They'd already gotten their pound of flesh, so to speak. I've also begun working with a Masonic youth-group called DeMolay - after a sixteen-year hiatus. My friend Ted is a national-level leader in the group, and the leader-of-advisors for the northwest Ohio region. So I am just starting to work with a struggling chapter in Van Wert (yes, the district is that big), and dealing with the challenges that teenaged guys can offer. It will not be easy, by any means, or cheap (100 miles each way to Van Wert, at nearly $3 a gallon - don't even get me started....). But it will be good. I have some gifts to bring, I think. Let your light shine before others, I guess. Is it all kinds of bad, or, only a little bad that I was running through Michael's (and, we all know how I feel about Michael's) muttering obscenities during Holy Week whilst looking for modeling clay for Busy Boy's crucifix project? Just checking to see if Jesus is offended, or, if He hates school projects as much as I do. Well, BusyMom, I'm no expert, but I'd say that if Jesus knows your heart (as so many folks say he does), then I'd bet there would be compassion and love for the heart of a frazzled mommy, even during Holy Week. To me, that is the heart of the believer's struggle everyday - Christ is risen, and yet life goes on. The challenge is to make that truth known in the mundane-ness of everyday life, it seems. Even in the middle of school projects at Michael's. The flowers and banners still stand in the sanctuary. Sheet music for "Jesus Christ is Risen Today!" still sit on the organ bench. But the trumpets have been packed away, and even the echoes of the hymns and the congregations shouting "He is risen indeed!" have died away. And we are left with these two poignant images: the disciples who still did not understand, and the disciple who had trouble believing. The world is not that different, today, than it was on that first Resurrection Monday, is it? There are still people in the church who wonder why Jesus had to die to make this life complete. There are still people in the world who say, "Hey, unless this Jesus guy shows up here, and speaks to ME, how do I know he exists?" In Easter version 1.0, the answer is simple. Jesus appeared to the apostles, to the women, in the Upper Room, and to hundreds of people around Judea. People saw Jesus, heard his encouragement for them, and his call to reach and teach others what he had taught them. Perhaps - just perhaps - the answer is the same for us in the light of Easter 2007. Perhaps we, as followers of a risen Savior, need to ensure that people see Jesus - in us. Perhaps we are the ones to make Christ's loving, caring, healing presence known in the world. Perhaps God's hands and feet need to be seen at the ends of our arms and legs. Perhaps the light needs to shine on the Cross, and the empty tomb, and not on us as the Church. Perhaps the doors of our churches need to be flung open as wide as the tomb was - so that the world at large can join us sinners on the inside, and come to know what we know about our own sins - and about redemption. God, this day, let your Son's eternal life be seen in my life. Let my actions reflect the light of your love into the world. Let me live this day in the light of the empty tomb. And may each of us, as followers of Christ, be someone that will let the world see your good news: "He is RISEN! He is risen INDEED!"